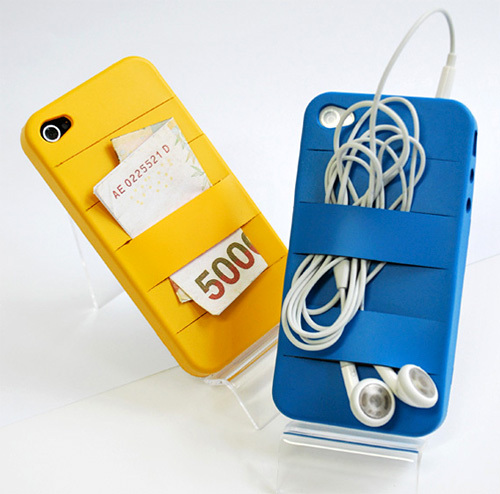 Elasty iPhone Case Is Brilliantly Simple, Infinitely Useful | OhGizmo! Belkin isn’t a completely unknown electronics brand, I’m sure many of you have heard of them and may even own one of their products. But if they manage to follow through with this brilliantly simple concept for an iPhone case, I think they could easily have a best seller on their hands, and gain some valuable notoriety. The Elasty, created by Yoori Koo, actually won the Korean Belkin Design Awards, and was inspired by wrapping elastics around your iPhone so you can use it to hold things on the back. The problem with elastics though is that they also block your display, so the Elasty case provides similar functionality in a more usable iPhone shell case. The product shot does a great job at showing how and why the case would be useful, but there are probably an infinitely number of other ways you could use it too.